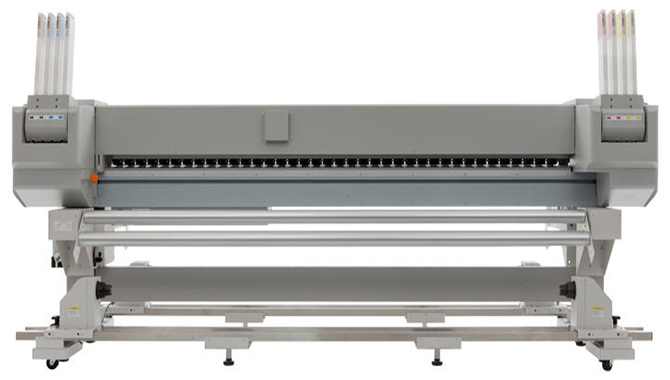 The ValueJet 2638 printer incorporates a staggered dual head setup with latest generation piezo drop-on-demand variable drop “wide model” print heads. Each 1440-nozzle head (8 lines of 180 nozzles) incorporates four colour sections, divided in two nozzle rows with 360 nozzles per colour. he VJ-2638 printer offers you a wide range of print modes and speeds. The overview below lists the most popular ones with which impeccable printing quality can be obtained. Quality – 720x1440 dpi: 17.0 m²/h. Production – 720x720 dpi: 36.0 m²/h. Billboard – 360x720 dpi: 48.3 m²/h. Mutoh Eco Ultra Inks are by far the most popular inks on the market for outdoor sign applications on a wide range of uncoated and coated substrates. The inks are based on non-aggressive solvents and do not spread any harmful VOCs in the working environment. As a result, there is no need for forced ventilation. Available in easy-to-use cassettes & 1 litre ink bags, Eco Ultra inks are Mutoh’s third generation of eco inks featuring improved ink fixation, better drying, higher print speeds and improved scratch resistance. Prints made with Eco Ultra inks are water resistant and offer an outdoor UV-resistance for up to three years outdoors*. 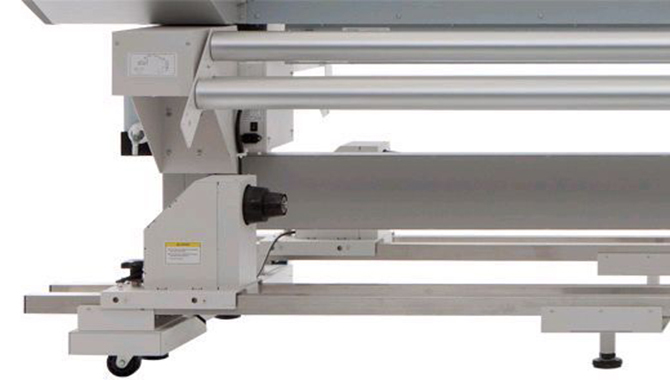 The ValueJet 2638 printer can handle 2” and 3” rolls. To cope with the higher print speeds and in view of drying efficiency, the machine incorporates a redesigned print platen structure with three individually controlled heating elements. The heating elements will tackle media pre-heating, ink fixation and drying of the prints. 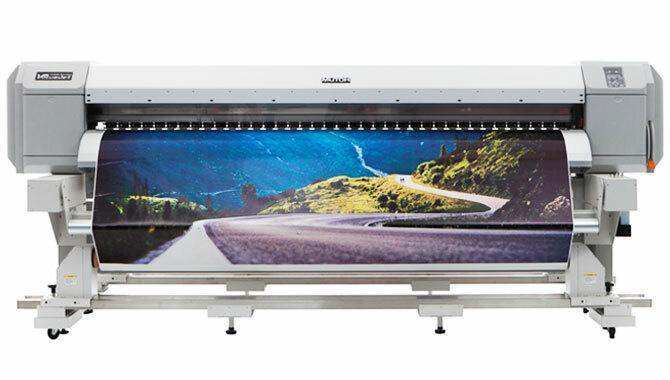 The ValueJet 2638 printer using Eco Ultra / UMS ink is ideally suited to deliver top quality images when printing directly onto a wide range of low-cost standard available uncoated PVC, banner and soft sign materials as well as for coated substrates. 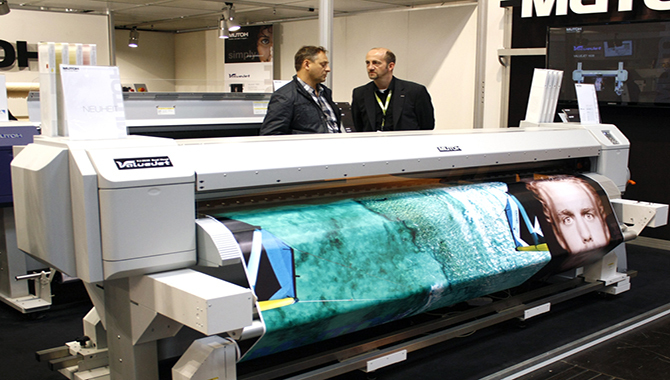 Targeted at the sign & display market, the Mutoh ValueJet high speed, high quality VJ-2638 printer will address the needs of PSPs and commercial printers looking for a high volume printing solution whilst requiring media compatibility with media rolls up to a width of 2.6 m. The VJ-2638 printer is suited for the production of long-term outdoor posters, signs and banners, backlit signage, POS displays, vehicle graphics as well as high quality durable prints for indoor use.